What's got Hong Kong spooked this Halloween? it's Giordano? Wall Street Journal: "Clothing retailer Giordano International Ltd.–the Gap of Asia–occasionally releases collections of themed t-shirts, such as ones sold this summer celebrating the Beijing Olympics. For this Halloween season, Giordano took inspiration from the bloodletting in the world’s financial markets — mixed with a bit of creative misspelling to dodge lawsuits. 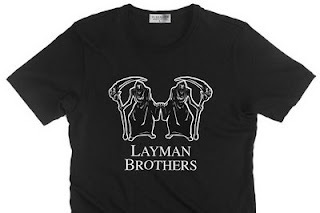 One shirt features two grim reapers above the name “Layman Brothers,” while another features the logo for AIG with a skull in the place of the I. The most gruesome features the “Merirll Lynch” bull chopped up like a bloody slab of meat. The shirts(See more shirts) go on sale in Hong Kong on Oct. 24, and will cost HK$120 (US$15.47) for as long as supplies last." 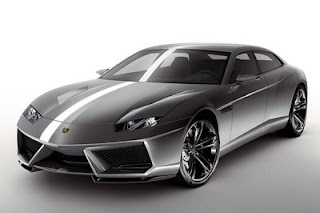 FF: "Good job Giordano, but i don't think I will wear this to LKF =_="
Autoblog: "It is a Lamborghini like no other before it: a four-door sports car that sticks resolutely to its creed. The Lamborghini Estoque concept has everything that defines a Lamborghini: extreme, uncompromising and unmistakably Italian, it brings a whole new versatility to the brand's DNA - with its four seats and ample luggage space, this "everyday sports car" is a perfect fit for an equally versatile lifestyle. Lamborghini Estoque is a study, a concept created specifically for the 2008 Salon d'Automobiles in Paris. From the very first glance there can be no doubt that this is a Lamborghini - a car with compelling presence, both unique and unmistakable. The long wheelbase, the low profile, the broad track, the mighty, accentuated wheels, the clean surfaces and razor-sharp definition - every single line breathes the spirit of the Lamborghini brand." FF: "Lovely, feels like controlin the Gundam"
YankoDesign: "We all know alkaline batteries are really bad for the environment if you don’t dispose of them properly. The right thing to do is send them to special recycling centers but hundreds of tons end up in landfills where their toxic innards seep into the earth. 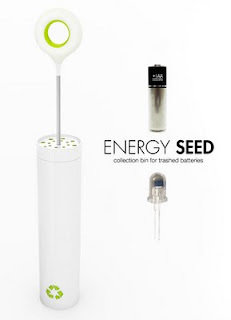 Perhaps a good solution is the Energy Seed, an LED lamp post powered by trashed alkaline batteries. The idea is to encourage people to throw their batteries away into the Energy Seed. There’s a slot for nearly every size battery. The unit combines any left over juice from all the batteries to power a super efficient LED ring. Of course once the bins are full, we’re left with the same original problem. Somebody has to collect all those spent batteries and recycle them." FF: "I think HK Gov sud plant some of them in Wan Chai and CWB, then we will recycle batteries"